The shift to online channels has long since ceased to be a current topic among companies in retail and banking, for example. These companies have redefined the customer relationship model, not only in their industries, but in other sectors as well. The utilities industry, which has traditionally not been engagement intensive, is being affected by this model redefinition and progressively moving to digital channels. The rise of purely online players, increasingly blurred market boundaries as utilities offer additional services, and new customer experience requirements have made this online move both challenging and critical. In this viewpoint, Arthur D. Little analyzes Spanish online utility customers to understand how they engage with their utilities, highlighting the existing relationship between engagement, satisfaction and value and focusing on the growing relevance of online engagement. Furthermore, it points out the important gap that exists between challengers’ and incumbents’ online channels and engagement, reinforcing the call for urgent action. Engagement, satisfaction and customer value are deeply intertwined. Assuring engagement and satisfaction is especially relevant in a market as dynamic as Spain’s, with over 14 percent of customers having switched suppliers over the past year. Online switching still represents only a fraction of those who switched, but several indicators point towards its growth in the near future. The relevance of the online channel for searching and comparing and the potential limitations to doorstep selling are just two examples of these drivers, as experience in other markets has shown. In this growing online reality, new online challengers are being quicker and more effective in catering to evolving customer tastes, while incumbents’ online channels are still lagging behind. Not only do incumbents’ customers engage less often with their suppliers, but when they do, it is mostly to generate non-value-adding interactions. On the other hand, challengers generate more value-adding interactions across both their physical and online channels. Incumbents are faced with an urgent call for action. They must adapt their online channel offerings to ensure customer satisfaction and retention, and to position themselves for the new wave of online switching. This adaptation will involve a complete overhaul of their existing marketing and sales budgets and reconsideration of their commercial strategies, in order to differentiate the service offering and the company positioning, and to defend the margins in an ever-more-competitive marketplace. The utilites industry has reached a tipping point. Now is the moment to decide which way to go. 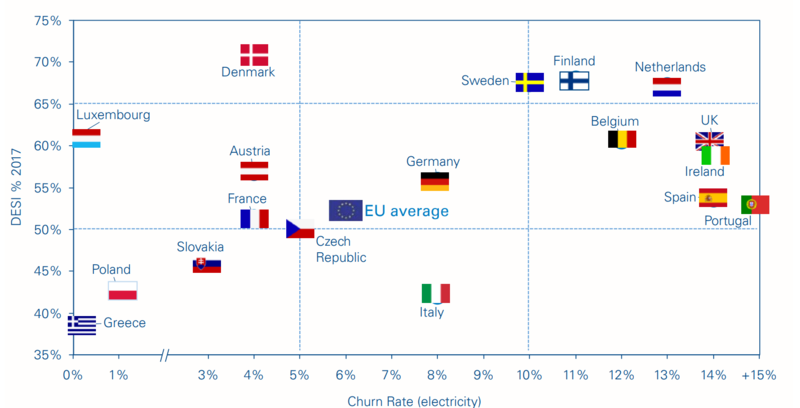 New offers and services, evolving consumer attitudes and competition are some of the main trends and changes affecting the utility-customer relationship in most European markets. Currently, most of these changes come from online channels and digitalization, which have major impact on aspects such as engagement and switching behavior, and are setting the “new norm” in terms of service and availability. The Spanish market’s digitalization level is in line with the EU’s average and above that of other countries such as Italy and France, according to the European Union’s Digital Economy and Society Index (DESI). DESI evaluates each country’s digitalization in five main dimensions: connectivity, human capital, use of internet, integration of digital technology and digital public services. Although in line with the EU’s average, Spain’s level of digitalization still lies below that of the UK, Germany and Belgium, among others.